Minimalism Toolkit available for FREE - Look Inside!Ever been stressed out by the clutter on your desk? Or when you’re trying to find an important document, or a specific outfit from a messy closet? The truth is – the more stuff we have, the more difficult it is to keep them organized. The more clutter and mess we end up with as a result can lead to a stressful day, and this stress can build up over time. This has to stop. 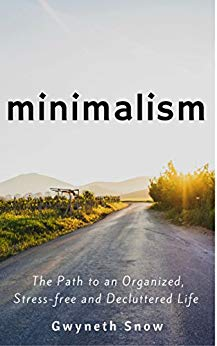 Minimalism: The Path to an Organized, Stress-free and Decluttered Life is my humble attempt to help you realize the benefits of incorporating a minimalist lifestyle in order to rid your life of excess in a systematic and strategic way. Here’s a quick overview of the book:•The first section of this book highlights a brief history of minimalism and its origins. It also covers how the minimalist movement has evolved over time, what modern day minimalism looks like, and its benefits. •The second section covers a wide range of strategies and techniques that you could use to declutter, get organized, and live in a stress-free and minimalist home. •The last section highlights what a minimalist lifestyle could look like; it covers a wide range of topics including minimalism in money, health, relationships, and much more. My goal, through this book, is to empower you to find joy in simplifying and to find happiness in fewer things that truly matter. To move towards a more organized, peaceful and decluttered life, read this book today!PS. Join my VIP mailing list to receive a FREE copy of “The Minimalism Toolkit” which highlights the key strategies from the book. Sign up by clicking the link on the first page. Enjoy!